The Brazilian Real has been the world’s best-performing currency against the Dollar in the year-to-date, having risen 32% through the beginning of October. At this point, a mere 8% rise would send it crashing through the high that it touched last summer, prior to the collapse of Lehman Brothers. The currency has now firmly returned to pre-credit crisis levels, suggesting that investors have once again become complacent and/or they believe the worst of the recession is over. For now at least, the data appears to support that notion. After contracting for two consecutive quarters, Brazil’s economy grew at a healthy clip of 1.9% in the second quarter, compared to the previous quarter. “Brazil is the first Latin American country to emerge from recession—and one of the earliest among the G-20 countries to have done so—following a 1.9% quarter-on-quarter expansion in economic activity in the April-to-June period,” summarized The Economist. To put things in perspective, the economy still contracted on an annualized basis, but such is to be expected considering the depth of the recession. Accordingly, the economy is projected to remain flat for the year in 2009 before returning to consistent growth in 2010. Some commentators have explained this in terms of “decoupling,” the pre-crisis theory that held the global economy (and certain emerging markets) were no longer dependent on the US to drive growth. While the simultaneous recessions in virtually every economy initially seemed to disprove that theory, the fact that some (Brazil, China, etc.) are recovering faster than others is causing analysts to once again asset its merit. 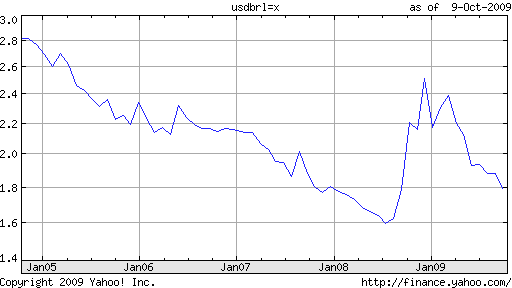 However, a Google News search of “Brazilian Real” displays a preponderance of stories that connect the Real with the Dollar, so it seems the decoupling is still partial at best. 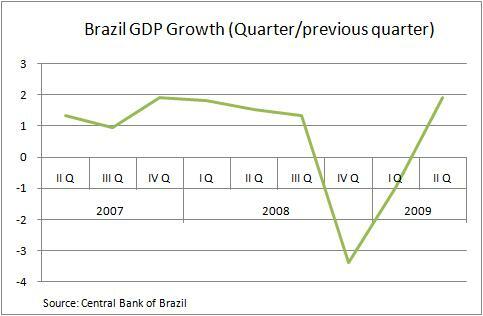 The fact that Brazil’s economy entered the recession late and emerged early can be attributed to an exceptionally well-balanced economy. Exports account for only 13% of Brazilian economic output. In addition, commodities comprise the majority of exports, for which demand remains relatively strong. Compare this to China, which derives 40% of its GDP from exports of namely consumer and industrial goods. Domestic consumption has also remained strong, such that Brazil hasn’t had to promote fixed investment and subsidize growth with government spending. As a result, the government’s fiscal position remains extremely strong. Its bonds remain investment-grade, which is a unique accomplishment in a region known for defaults, especially during recession. Despite the comparative lack of risk, Brazilian interest rates remain extremely high, even when adjusted for inflation. The benchmark Selic rate currently stands at 8.75%, and there is speculation that the Central Bank will follow the lead of Australia, another commodity rich country, and tighten soon. Interest rate futures currently reflect a 1.75% rise in rates by January 2011. Investors have taken the hint and poured funds into Brazilian capital markets. Equities are surging, thanks to demand for shares in Santander, a recent IPO and one of the largest in Brazilian history. Brazilian bonds are also selling well and are often oversubscribed (when demand exceeds supply) by investors. Due to such strong fundamentals, meanwhile, the word “bubble” hasn’t featured too prominently in investor circles…yet. 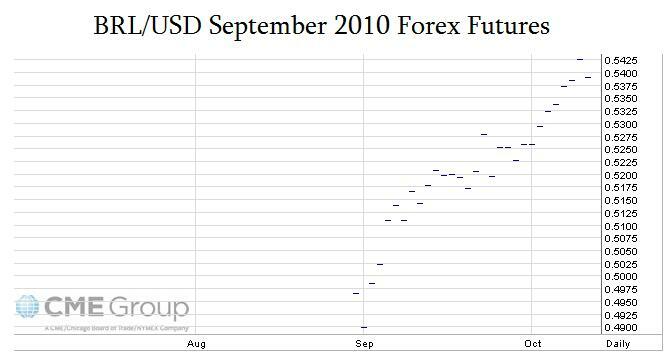 At the same time, currency futures are pricing in a gradual decline in the Real over the next year, implying that its run could soon come to an end. It’s been awhile since I’ve heard mention of this pair. Very intriguing analysis here.